RK Products redesigns mud scraper for Deere and Kinze planters. A new design, bolt-on mud scraper for John Deere and Kinze planters offers improved mud disposal as well as improved operation in residue-strewn fields. Designed with a 45-degree angle operating position, the new mud scraper from RK Products bolts on, requires no reworking or welding, and fits closer to the gauge wheel. The mounting bracket is easily clamped to the hub of the gauge wheel arm with a U-bolt. Two milled surfaces provide contact with hubs of different sizes. Two cone point set screws are embedded in the surface of the hub to provide a rock-solid mount with angular and lateral adjustments. 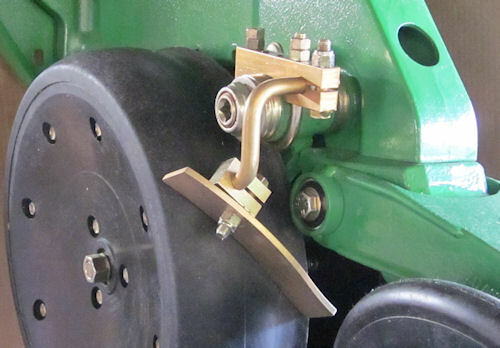 RK Products is marketing this "no-weld, no-rework" gauge wheel mud scraper for John Deee and Kinze Planters. The scraper blade is made from 3/16-inch heat treated steel, and comes in three shapes for older, flatter gauge wheel designs; a regular profile for most newer tires, and an "IH Profile" for tires with a reduced inner diameter. For more information on the new scrapers, contact RK Products at (800) 580-6818, or go on-line at www.rkproducts.com.